Over the period 12-15 August 2017 the Johannesburg Art Gallery (JAG) held four “(Re)Call and Response” workshop in preparation for a “tester” exhibition of items from the gallery’s so-called “traditional” collections. Items under discussion included carved wooden vessels, headrests, staffs, kierries and snuff boxes all accessioned as “Northern Nguni” by the JAG. These form the Nicholaas Maritz Collection, a recent purchase by JAG, which is scheduled for public display. Due to the challenges and contestations faced by galleries exhibiting material of this nature, it was decided that the workshops, as well as a “tester” exhibition in November this year, should be held to gather knowledge and consider strategy in preparation for a comprehensive exhibition in 2019. 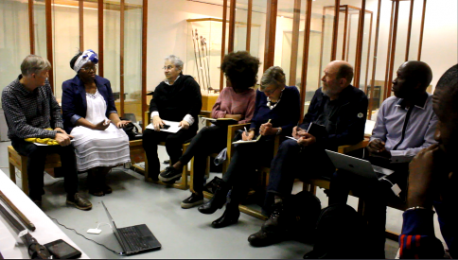 The workshops, which turned out to be lively and constructive affairs, were facilitated by the JAG curator of these collections, Philippa Van Straaten. Also in attendance were Nessa Leibhammer (Van Straaten’s predecessor at JAG and research associate at the APC); African art authority Prof. Karel Nel of Wits University; Leketi Makalela, Professor and Head of the Division of Languages, Literacies and Literatures at Wits; Galefele Molema, museologist, radio presenter, lecturer in town planning at Wits and grandson of historian Silas Modiri Molema; artist and curator Bongi Dhlomo-Mautloa; and educationalist and linguist Liz Burroughs. The “traditional” collections at JAG are currently constrained by colonial-styled classification, ahistorical ethnic identities and alienated from their personal histories and provenances. The collections that were the subject of the workshops, were also, significantly, the point of departure for the recently released APC publication Tribing and Untribing the Archive [add link to book on website]. The edited collection tracks how the domain of the tribal and traditional was marked out and came to be sharply distinguished from modernity, how it was denied a changing history and an archive, and was endowed instead with a timeless culture. Offering strategies for engaging with the materials differently, the publication served as impetus and inspiration for the JAG workshops. On the last day Grant McNulty of APC presented the FHYA archival database to the workshop. It is hoped that the “(Re)Call and Response” project will be able to feed into, and draw from, this database on which 75 objects from JAG have already been uploaded.